An old ruined abbey in Scotland? Yes please! I shared a photo from Holyrood recently and thought I would go ahead and share this one as well. I took quite a few there, but in some cases had tourists wander into one of my frames, so I need to spend a little time working on those and getting them ready to share here - lots to do! 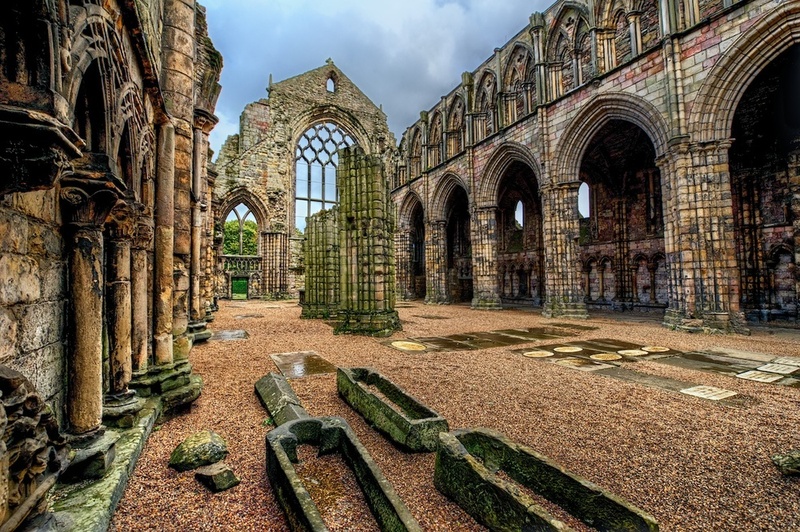 Holyrood Abbey sits at the end of the Royal Mile in Edinburgh, Scotland. It's right behind Holyrood Palace, which is the Queen's official residence in Scotland. While the palace is pretty nice, I was really fired up about shooting these ruins. I love ruins, and castles, and churches, and HDR, and Scotland...so it was like a combo of everything I love to shoot all rolled into one! It was awesome! I had the benefit of nice afternoon light and some clouds in the sky - but no rain! - and was able to capitalize on the nice weather. It was a Sunday afternoon though, hence my earlier comment about tourists which I'm guessing you could avoid if you went on a weekday afternoon, for example. But regardless of when you go, be sure and bring the camera and get ready to fire a lot of shots here - it's really a beautiful place!